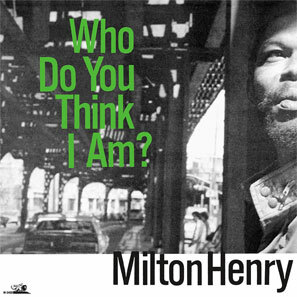 Milton Henry: Who Do You Think I Am? 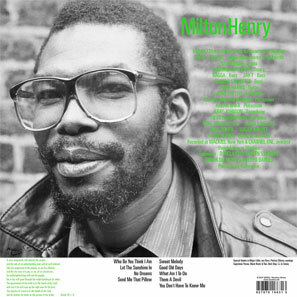 Milton Henry’s handful of classic sides - like his version of Gypsy Woman, or Cornbread and Butter (for Freedom Sounds), or This World and Follow Fashion over the Upsetter’s Fever rhythm (under the artist name King Medious) - made him a natural Wackies’ recruit when he relocated from Jamaica to New York City in the late seventies; and he was soon fully involved in the day to day business of the operation, supervising sales and promotion, making deliveries, even holding spare keys to the studio for whenever Bullwackies himself was away. He appears in this activist role on the front-sleeve photograph, just up White Plains Road from the Bronx HQ: by its title, though, and first and last songs, this album also hints heavily at the past musical accomplishments of its mystery hero. The record was released first in London, in 1984, during the first months of Wackies Dean Street office, in north Soho. The band is basically Itopia. Sly Dunbar gets a credit - though neither he nor Robbie Shakespeare ever set foot in the studio - as acknowledgement for his rhythm recycled here as No Dreams. Jackie Mittoo and Bagga are pon the corner, from Studio One; Jerry Johnson and Neville Anderson on brass; also Sugar and Max Romeo; and Sonia from the Love Joys performs a duet. No Dreams is the true story of Milton sleeping in the attic above the studio when the rough drum and bass track came on to the desk, waking him, pulling him to the mic; Them A Devil is aimed at certain producers passing off the singer’s property as their own; Good Old Days was written for a poorly Junior Byles, remembering times shared.